Director Kevin Romeo and Rhino Media Productions from Kalamazoo, Michigan began with a humble idea to produce a film for beer fans and movie fans alike. With over 140 craft breweries in the state, and a run time of 120 minutes, it was impossible to pay tribute to all of them. Romeo and his crew visited over 30 breweries throughout the course of filming, but not all of them made the final cut. 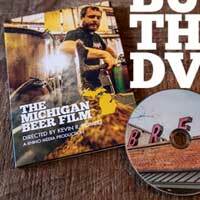 The Michigan Beer Film celebrates old core values in a new generation of community-conscious consumers and the proliferation of the Michigan craft beer industry. At the same time, the film addresses some challenges that brewers and entrepreneurs encounter in the midst of the industry’s rapid growth. The directors were very intentional in selecting the style of music for the Michigan Beer Film. They wanted for the film to convey the raw energy and emotion as was necessary. At the same time, they were very committed to using only Michigan based music. Below is a list of the amazing songs that were curated for this film.